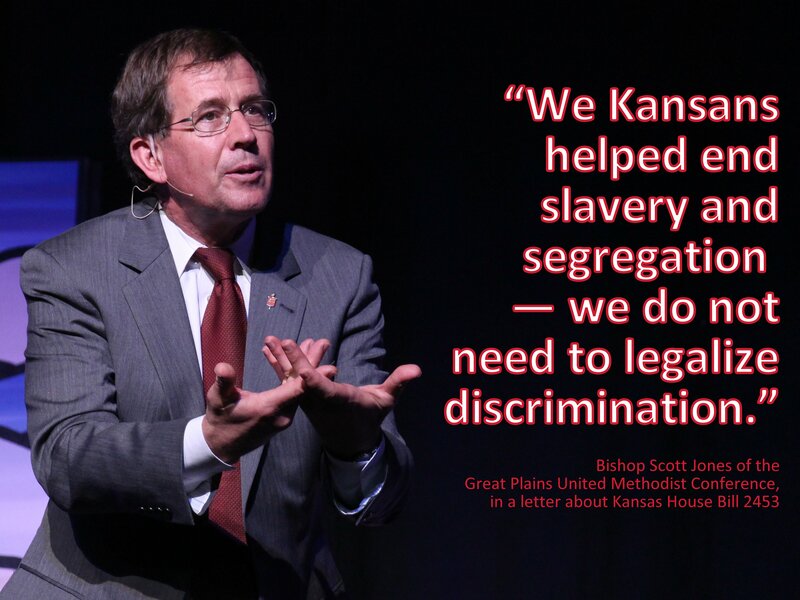 In a letter addressed to Kansas Senate President Susan Wagle, Bishop Scott Jones, bishop of the Great Plains United Methodist Conference, suggests that House Bill 2453 be killed, as to not legitimize discrimination against gay and lesbian individuals. House Bill 2453 seeks to allow public or private employees to refuse service based on religious views about marriage. In his letter, Bishop Jones, commends Senator Wagle’s statement expressing her concerns about the measure. Bishop Jones went on to mention that the debate seemed to be missing the fact that Kansas is more religiously diverse than in the past. Giving legal license to any religious opinions opens the door to several possible actions. House Bill 2453 passed the House on Feb. 12, with a 72-49 vote. Supporters of the measure say the intention was to protect religious liberty. Opponents say the bill’s wording allows it to have a much broader ramifications than what the House considered during two full days of hearings preceding the vote. Wagle said the bill goes beyond protecting religious freedom and potentially discriminates against the LGBT community. Wagle raised concerns about how the bill could affect the business community. The Kansas Senate Judiciary Committee, chaired by Senate Vice President Jeff King of Independence, Kan., will make the final decision whether to consider a modified version of the bill or kill it. A controversial religious freedom bill passed by the Kansas House will never make it to the Senate floor or even be considered by the Senate Judiciary Committee. On Tuesday, Senate Vice President Jeff King, R-Independence, officially closed the door on House Bill 2453, which gained international attention and inspired a Twitter hash tag.